Besides the near shore currents that we discussed in the last lesson, there are also several important currents that circle the world’s oceans. These currents, called surface currents, are all broad sections of continuously flowing shallow water currents driven by wind. The direction of the major surface currents is generally constant, because they are pushed by giant wind belts called jet streams which also flow in a constant direction. The ESRT page 4 has a map of Earth's major surface currents. If we look at this map we can separate each ocean by looking at its ocean basin. Within each ocean basin there are at least two major surface currents, that together form a loop, called a gyre. In the N. Hemisphere these gryres always move clockwise, and in the S. Hemisphere they always move counterclockwise. 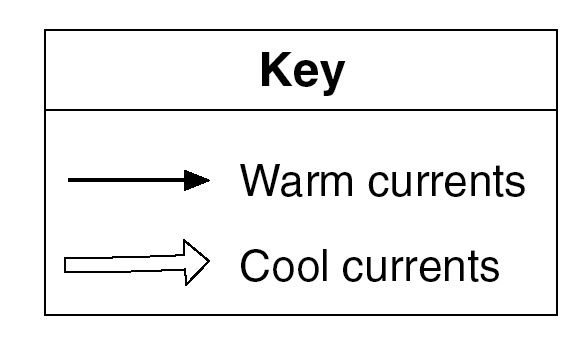 We can divide all surface currents into two different groups based on their temperature. Warm currents, and cold currents. With this differentiation we can start to make sense of the patterns we have already seen. Since most warm water is near the equator all warm currents must start here and flow away from the equator carrying the warm water with them. The Gulf Stream is a very important warm current because it effects the climate of the US and Europe. The Gulf stream begins near the Gulf of Mexico in the Caribbean and flows up along our East Coast then crosses the Atlantic Basin and ends near Ireland and England. This warm water makes our climate and England’s climate much warmer than it would normally be. Conversely, cold water is located near the poles, so most cold currents start in high latitudes and flow towards the equator bringing cold water with them. If we look at a map we can see that ALL WARM currents flow on the WEST side of the oceanic basin. 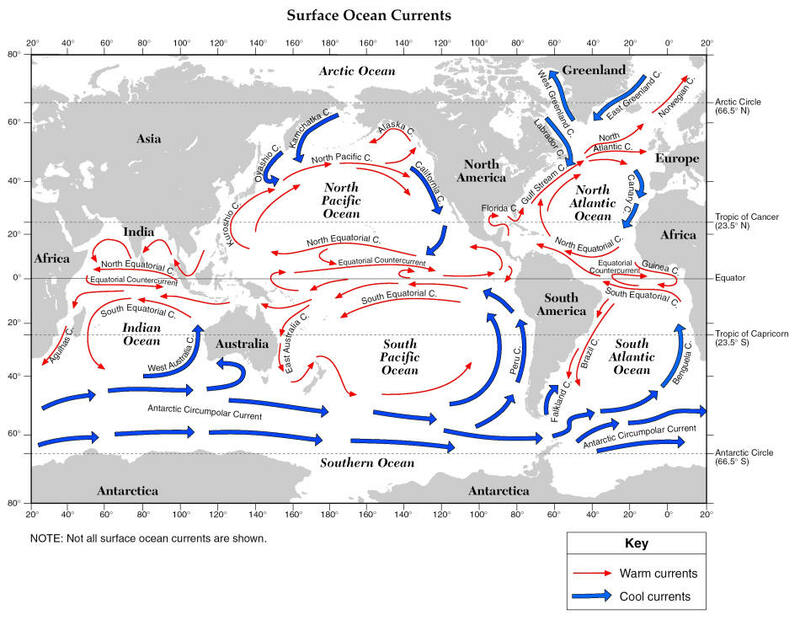 ALL COLD water currents are located along the EAST side of the oceanic basin. Let's Practice: What is the name, temperature, and direction of flow of the Peru Current? Looking at the map we can see that the Peru Current is cold water flowing North.